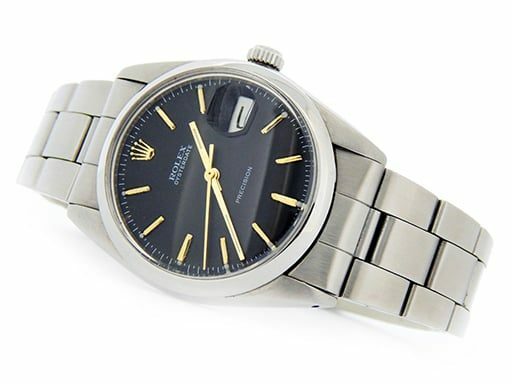 We offer a collection of preowned mens Rolex Oyster Perpetual watches in sizes 34mm and 36mm. 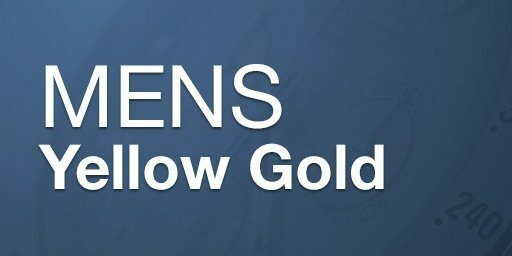 These come in stainless steel, two tone, and yellow gold. Choose from colorful dials and a variety of bezels and bands. Browse our selection for the watch that fits your style and budget. We think you’ll agree, wearing a mens Rolex Oyster Perpetual on your wrist puts you in distinctive company. 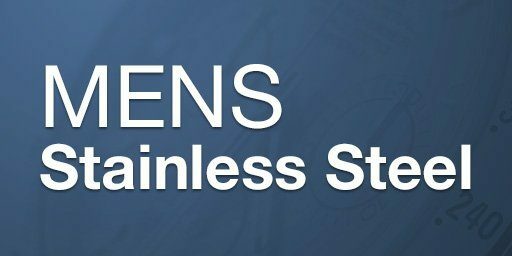 Keep in mind, we offer a 30-day money-back guarantee, free U.S. shipping, and available financing. However, our qualified customers also enjoy our Lifetime TradeUp Guarantee for further value. Also, we offer personalized customer service. So, please contact us if we can help. Stop us if you have heard this before, but Rolex is the most recognizable and most coveted watch brand in the world. 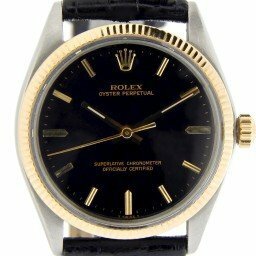 If you own a Rolex, you know this to be true, if you have never owned a Rolex, then you may wonder what the big deal is. 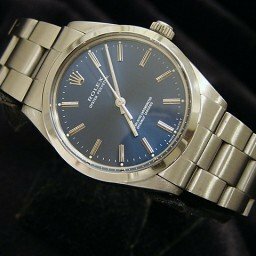 Here is where you start, take a look at our selection of pre owned Rolex watches, don’t just glance at them, really take some time to give each watch a good look over. Click on a watch and take notice of the details. Do you see what all the fuss is about now? 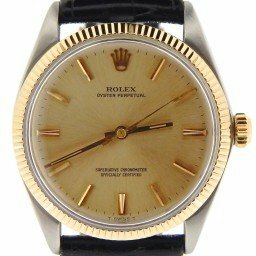 If you are hooked, here are a couple Rolex watches for new collectors. The Oyster Perpetual is the purest expression of a quintessential Rolex watch. 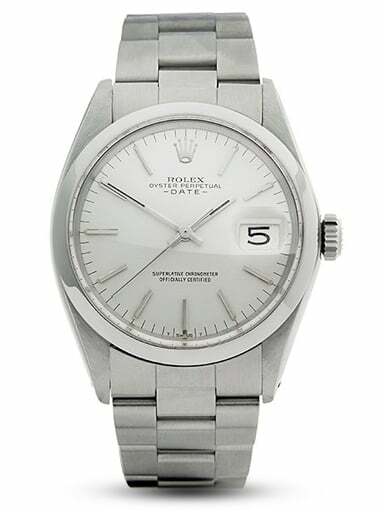 The Oyster offers many of the advances in watches that Rolex is known for, including the best technical developments. The stainless case is water resistant to 100 meters, the sapphire crystal is practically scratchproof and the crown uses the patented Twinlock system to help keep out dirt, dust and water. And like all Rolex watches, the movement is known for its precision and reliability. A true icon, the Rolex Explorer might be just the watch you want to sport on your wrist, and for good reason. The Explorer mirrors your adventurous spirit and you will consider it a guide to your success. Even the newer Explorers remain true to their roots with blue Chromalight hour markers and hands that assure visibility in all conditions and a sapphire crystal securing the movement against harm. The bracelet is fitted with the patented Oysterlock clasp for comfort and security. 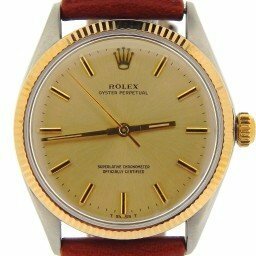 That’s a good start right there, check back soon for more Rolex watches ideal for new collectors. 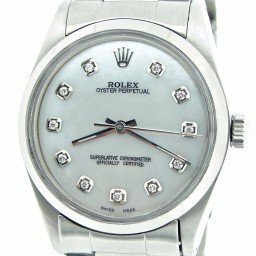 What are the Differences Between Oysterdate, Date, and Oyster Perpetual Rolex Watches? The Oysterdate, Date and Oyster Perpetual watches are three of Rolex’s everyday luxury timepieces. 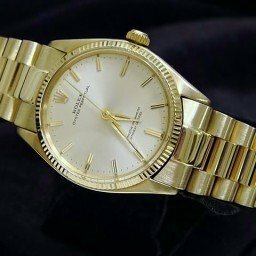 While they have their own distinct design and functionalities, these particular Rolex watches are often mistaken for each other. Let’s have a closer look at this trio of timepieces to highlight their similarities and differences. A standout detail of the Oysterdate Precision watch is that it’s a manual-winding timepiece rather than an automatic one. 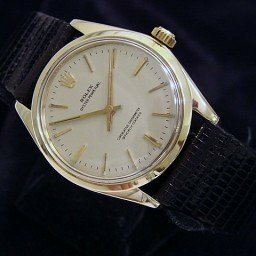 Rolex manufactured the Oysterdate Precision from 1950 until the late 1980s. 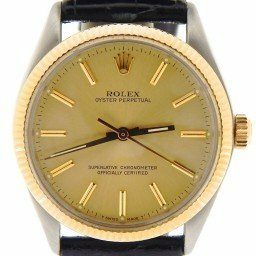 It’s perhaps surprising to some that Rolex would have kept a manual-winding Oyster watch in their catalog as late as the 1980s since the brand is so famous for their in-house “perpetual” movements. Furthermore, the Oysterdate is not a certified chronometer, hence its “Precision” label rather than the “Superlative Chronometer Officially Certified” designation. As its name suggests, the Oysterdate Precision offers a date function, in addition to the hours, minutes, and seconds. Early models of the Oysterdate did not include the Cyclops lens over the date window while later models did. Although there are several Oysterdate Precision references, the most famous and longest running one is the Oysterdate Precision ref. 6694. Design wise, the Oysterdate Precision sports a 34mm stainless steel case and matching steel Oyster bracelet. 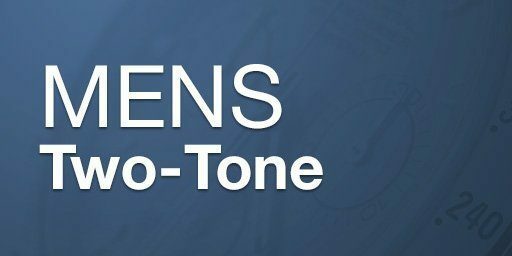 There are a few dial color options, as well as, a variety of numeral styles. Similar to the Oysterdate Precision, the Oyster Perpetual Date, a.k.a. 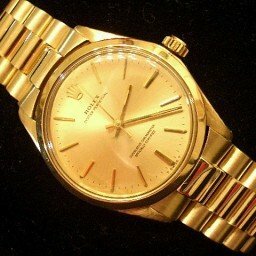 the Rolex Date, timepiece was also born in the 1950s. Moreover, it also includes the date feature. 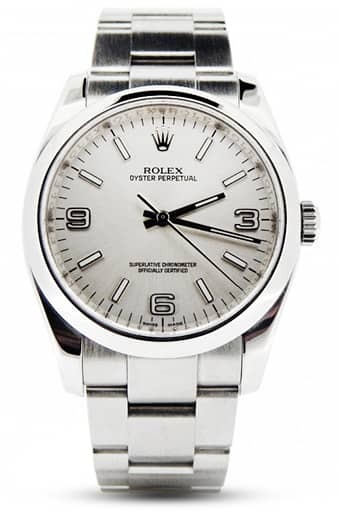 However, unlike the Oysterdate, the Rolex Date watch runs on an automatic mechanical movement. The Rolex Date is also known as the Oyster Perpetual Date, thus, signifying that it’s powered by a self-winding caliber. 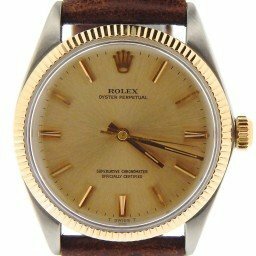 Remember, when looking at Rolex watch names, “Oyster” refers to the watertight case and “Perpetual” refers to an automatic movement. 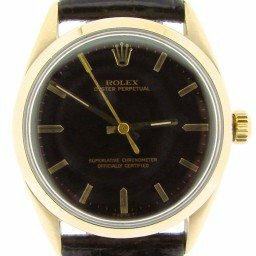 In the 1960s, Rolex unveiled the Date ref. 15xx series, which the company would manufacture until the 1980s, at which point it was replaced with the ref. 15xxx series. While there are smaller versions of the Rolex Date, the men’s versions are identical in size to the Oysterdate with 34mm cases. 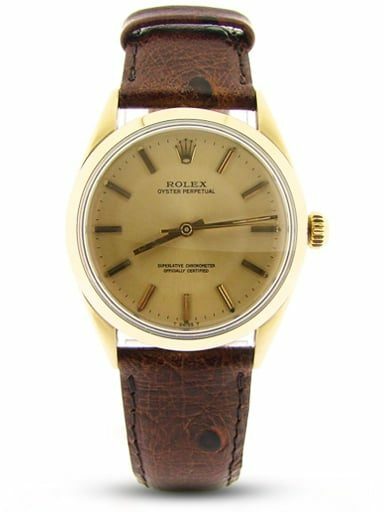 Vintage Rolex Date watches are available in steel, gold shell, solid yellow gold, and two-tone. 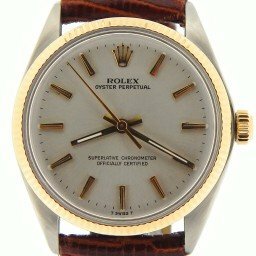 Today, however, the current Rolex Oyster Perpetual Date ref.  115200 is exclusively in steel. Here’s where things can get a little tricky. 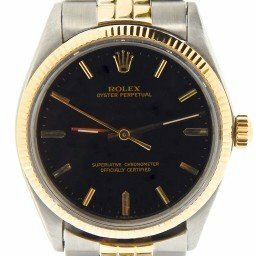 “Oyster Perpetual” is a label that Rolex attaches to their watches that include the water-resistant Oyster case and an automatic movement. 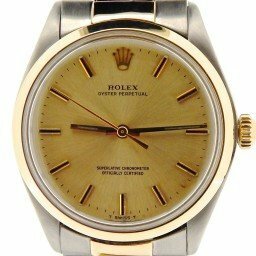 Yet, there is a specific collection of Rolex Oyster Perpetual watches as well, which is what we’re discussing here. Yet again, just like the Oysterdate and the Date, Rolex introduced the Oyster Perpetual watch in the 1950s. 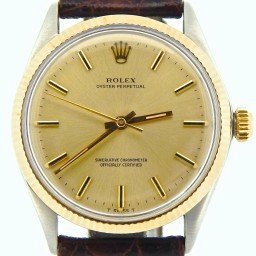 But unlike the above two models, it is a non-date Rolex watch. The Oyster Perpetual collection is an abundantly varied one with a slew of sizes and materials to choose from. 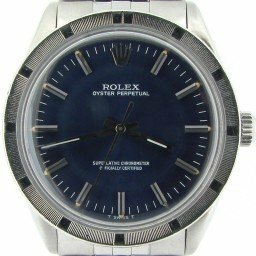 Vintage Oyster Perpetual men’s watches have 36 or 34mm cases while today there’s also the larger Oyster Perpetual 39 timepiece that made its debut in 2015. So to sum up, the Oysterdate is a steel 34mm manual-winding model with a date function. On the other hand, the Oyster Perpetual Date is a 34mm automatic model with a date function presented in a variety of materials. 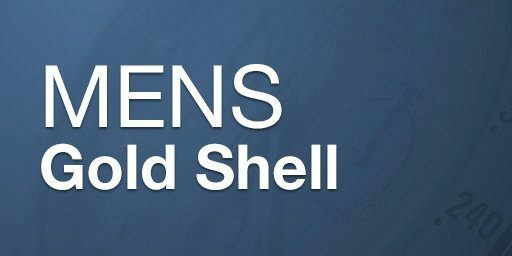 Finally, the Oyster Perpetual is an automatic no-date model available in a variety of sizes and materials. When deciding between the Oysterdate, Date and Oyster Perpetual, it’s important to take into consideration which sizes, functionalities, and aesthetics work best for you and your lifestyle.